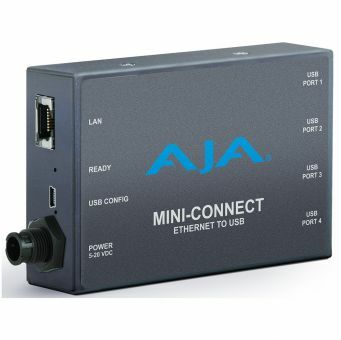 The AJA Mini-Connect device enables control of up to 4 USB-enabled AJA Mini-Converters over a single Ethernet connection. Mini-Connect integrates with your existing Ethernet network to provide access using any web browser for easy configuration and control of Mini-Converters anywhere in your facility. Mini-Connect extends control of your ROI Mini-Converters across the local network or across the web for access anywhere.